City’s engineering academics in the Systems & Control Research Centre organised a two-day Workshop (18th and 19th June) to address the challenges and possibilities for multi-disciplinary research in complex engineering systems – a follow-up to the half-day Workshop held at City on March 31st in collaboration with IEEE-SMC and INCOSE on “Engineering Sustainable Systems”. City engineering academics in the Systems and Control Research Centre (SCRC), brought together a variety of researchers from many diverse areas to explore complex systems challenges during the workshop held at the University from the 18th to 19th June. 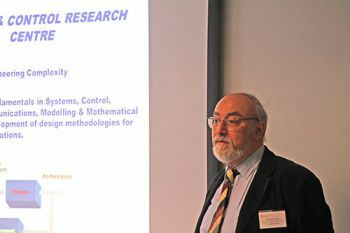 The Workshop, titled, “Complex Systems: Modelling, Emergence and Control”, examined several relevant topics such as Complex Systems and Emergence; System of Systems and Application; Control of Complex Systems, Cooperative Control; and the Simplification of Complexity: Modelling and Computations. City’s Systems and Control Research Centre was established in 2001 and came out of research carried out in Control Engineering in the 1980s and drew on studies carried out in networks, statistics, management and control systems. The management of complexity in engineering design and cyber security influenced the formation of the Centre. Complex Systems have emerged in several disciplines and domains and have many interpretations and problems associated with them. A major classification of such systems are to those linked with physical processes (physics, biology, genetics etc) and those which are man-made (engineering, technology, economics, management, social etc) and deal with decision making and working out solutions to complex problems. Expectations feedback and adaptive behaviour through learning are key ingredients distinguishing socio-economic systems from complex systems in engineering and the natural sciences. The individual elements of a system are influenced directly by the behavior of the system as a whole, and at the same time their interactions lead to the emergent behaviour at the aggregate level of the system. Such systems emerge in engineering, economics, finance and management which define a range of high complexity problems, requiring fundamentally new thinking and address complexity with an interdisciplinary approach going beyond the current approaches. Professor of Control Theory and Design, Professor Nicos Karcanias, was pleased with the outcome of the June Workshop. He views such an effort as the prerequisite for the creation of a critical mass for the development of a new Interdisciplinary Centre on Systems Complexity across the University with strong links with academics from other institutions and relevant industries. This June Workshop is a follow-up to the one held on March 31st (also held at City) on “Engineering Sustainable Systems”, which examined the close relationship of Sustainability and Systems Engineering. The seminar was a collaboration between City, the Institute of Electrical and Electronics Engineers Systems, Man and Cybernetics Society (IEEE-SMC), and the International Council on Systems Engineering (INCOSE), featuring speakers drawn from academia and industry.